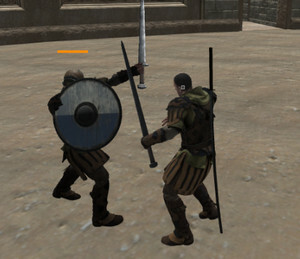 Gladiator Simulator Simulator games are sought in action games due to incredible graphics and gameplay. You are starting the game weaponless in a safe house. Select your sword and/or spear from the ground with E key. When you click on start to PLAY GLADIATOR SIMULATOR game, you are asked to select a battle ground. Then you may click on Z key to see controls that will vital important for you. Enemy gladiators will attack on you in crowd. You should not expect one-on-one battles. This is a survival challenge for you!